This skin has recently become quite popular, probably because of such an unusual idea – a combination of images of zombies and pigs. As a result, this is an unusual character that can interest many players. His appearance is both frightening and causes a smile. In minecraft 0.14.0 there will certainly be a place for such an original hero. 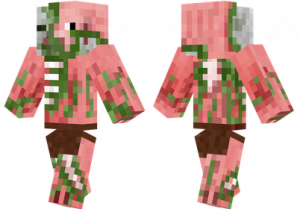 If you like this Zombie Pig Skin and you would like to try it on yourself in your favorite game – then Zombie Pig Skin for Minecraft PE 0.14.0 can be downloaded right now. Try, suddenly, this character will most naturally fit in today’s game!